Whether you want an elaborate centerpiece to grace your Thanksgiving dinner table or a simple table decoration to bring some autumn beauty to your home, making your own centerpiece is a great way to be creative and frugal at the same time. Try some of these ideas to warm up your dining room as the weather turns chilly. The height of traditional bouquets can interfere with eye contact and conversation, which is the last thing you want if you're hosting Thanksgiving dinner or having an autumn dinner party. In this type of situation, it's best to create a long, low centerpiece with lots of fall charm. You'll need a long dish, such as French bread basket or other serving piece. You'll also need several colorful fall blooms like Gerbera daisies, a few small glass vases, some dried grass or raffia, and a few fall gourds. Place the long dish where you will want it on your table. You can move the centerpiece later, but it's easier if you construct it in place. Put one small vase in the center of the dish. Place two to four other vases evenly along the length of the dish. Spread the raffia or dried grass around the vases, covering most of the dish. Fill the vases about 3/4 full with water. Cut a Gerbera daisy for each vase, leaving the stem only about three inches long. Place the daisies in the vases. Add gourds between each vase so that the display alternates between gourds and fall flowers. 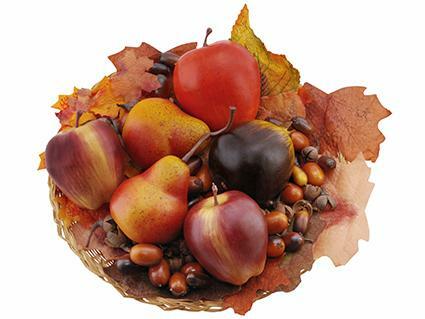 The classic symbol of the autumn harvest, the cornucopia makes a great fall statement on your table. To make this pretty decoration, you'll need to purchase a basket cornucopia, such as the Harvest Fern Cornucopia from Amazon.com. You'll also need water picks and florist's tape, which you can pick up at your local craft store, as well as lots of beautiful fall blooms. Choose about seven large blossoms, such as sunflowers, and lots of smaller flowers in autumn shades. Start by cutting the five large sunflowers to fit the size of your cornucopia. You'll want them to be slightly varied in length. Lay them gently in the basket as you work. When you're happy with the length, cut each stem at an angle and slip a water pick on the end. This will help preserve your arrangement. 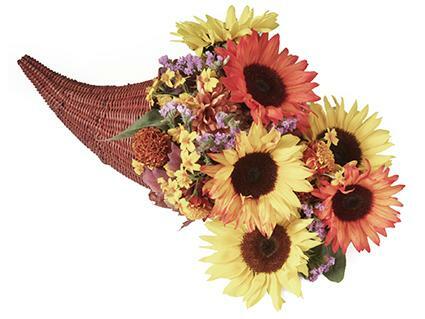 Arrange the sunflowers in the cornucopia and then wrap your hand around the stems to hold them in the desired location. Loosely wrap florist's tape around the stems to hold them. 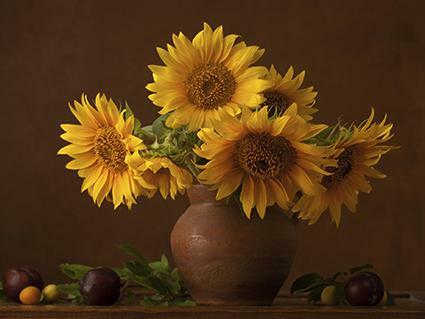 Holding the sunflower bouquet in your hand, add smaller blooms between and around the sunflowers, slipping some of the blooms into the florist's tape with the larger sunflowers. Don't trim the stems on these yet. Continue adding these filler flowers until you are happy with the shape of the bouquet. Wrap the entire bouquet in more florist's tape to hold it securely in place. Cut the stems of the smaller flowers and use water picks to keep them fresh. Slip the bouquet into the cornucopia and place it on your table. Autumn has abundant natural beauty, especially when it comes to leaves. 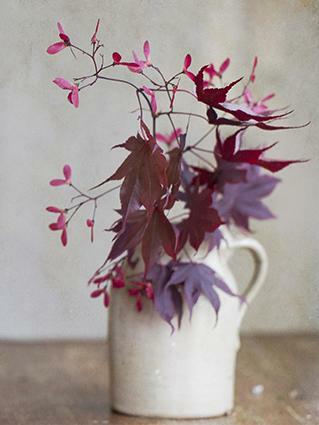 You can create a very simple and lovely centerpiece by displaying natural foliage in a rustic vase or jug. You can find a unique stoneware jug at an antique store or flea market. Cut branches of your favorite fall leaves. You can use as many as you like, but it's always nice to stick with odd numbers. Choose another type of leaves or flowers and cut a few of these. Trim the leaves off of the lower portion of the branches. It's important to avoid having leaves on the part of the branch that will be submerged in water. Arrange the branches in the stoneware vase or jug and add water to keep them fresh. Gourds come in an amazing array of colors, shapes, and sizes, and you can easily find them at any autumn farmer's market. Grouped in a simple basket, they make a casual, rustic centerpiece for your dining table or coffee table. 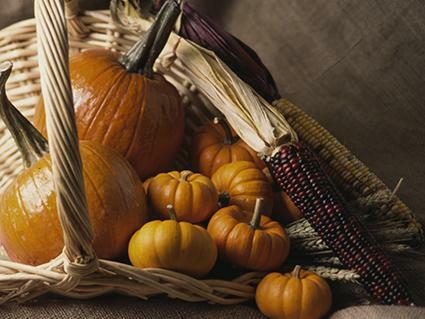 Choose lots of gourds in a variety of colors and shapes, but try to pick ones that are around the same size. 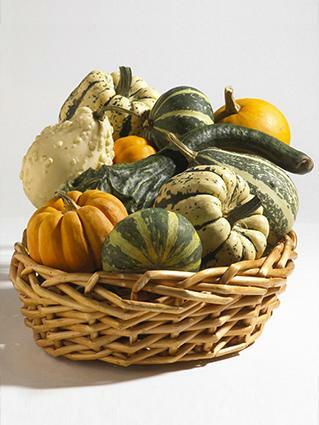 Place a basket on your table and begin adding the gourds. As you add them, make sure the stems are pointing up and out. Add another layer of gourds on top of the first. Place the prettiest ones on top. Although this centerpiece idea looks complicated, it's actually a very simple project. Because the pumpkin has plenty of moisture, it will keep the flowers fresh for a few days. You'll need a pumpkin, between 100 and 200 chrysanthemums, some scissors, and an awl. Start by using the awl to poke holes all over the pumpkin. Make the holes about two inches deep, and space them about 1/2 to 3/4 inch away from one another. Don't poke any holes in the very bottom surface of the pumpkin. Run the pumpkin under water or use a damp paper towel to remove any residue from the poking. Cut off the flower heads on the chrysanthemums, leave stems that are two inches long. Remove any leaves as you go. The number of blooms you need will depend on the size of your pumpkin. Begin inserting the flower stems into the holes you made with the awl. 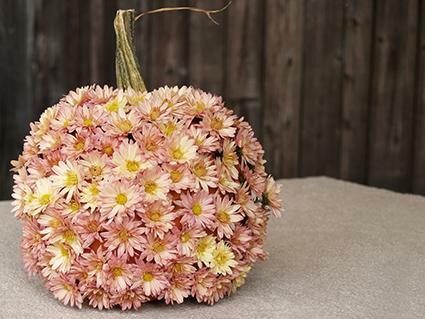 Overlap the flowers slightly to give your pumpkin a nice, full appearance. When the whole pumpkin is covered in flowers, place it on a plate or other dish and display it on your table. 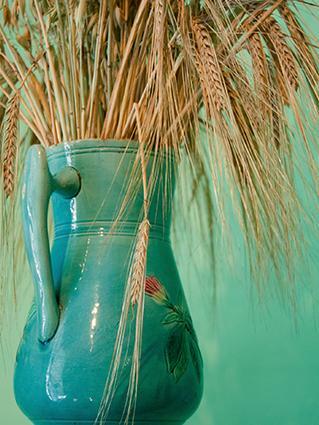 Sometimes, a centerpiece can be as simple as a neutral bouquet of dried wheat displayed in a pretty pitcher. You can find unique vintage pitchers at your local antique store, or you can display a favorite family heirloom. Measure the height of your pitcher and the width of its mouth. You'll need to know the height and width when purchasing wheat to fill the pitcher. Purchase the wheat from you local craft store or from an online retailer like Dried Flowers R Us. You'll need enough bunches to fill the pitcher loosely, and the stems should be at least 12 inches longer than the height of the pitcher. Choose colors of wheat that compliment the color of your pitcher. Arrange the wheat in the pitcher, trimming the stems as needed. Allow some of the stems to bend down, giving the bouquet a graceful feel. If you want, you can use floral wire to wrap the stems just below the mouth of the pitcher. This super easy centerpiece idea is perfect for displaying on your table between meals. When you are getting ready for dinner and need the table clear, you can simply use the handle to move the basket to another location. Be sure to pick up plenty of extra apples since people are likely to sample from this delicious fall decoration. Choose a basket with a simple design and a handle. Line the bottom of the basket with a plastic bag to keep any apple juice from staining your furniture. Select some beautiful apples from a local orchard. 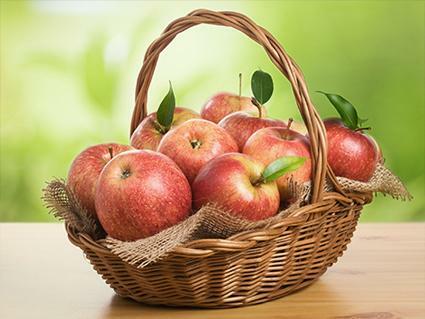 Jonagold apples are a lovely choice because of their variegated coloring. If possible, find apples with a few leaves attached. Spread a small piece of burlap fabric in the basket. Place the apples on top, piling them high. You don't have to have a fireplace to bring a cozy, warm glow to chilly fall nights. 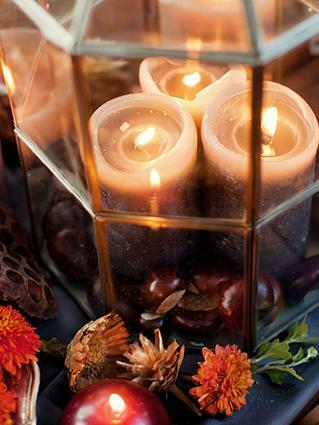 Use an enclosed candle lantern and some special decorations to create a centerpiece that really shines. You can use any style of candle lantern you like. You'll also need apple-shaped candles, available for about nine dollars on Amazon.com, pillar candles, dried apples, and fall flowers. Place the candle lantern on a simple platter. Put three pillar candles inside the lantern. Cut the blooms off of the fall flowers and scatter them on the platter around the base of the lantern. Put a few slices of dried apples inside the lantern, using care to keep them away from the wicks of the pillar candles. Add a few apple-shaped candles outside the lantern on the platter. Place the centerpiece in the desired location and light the wicks. While fresh flowers are lovely, you can't use them year after year. For a decoration you can reuse for many autumns to come, create a simple centerpiece from artificial fruit and leaves. You can purchase very realistic fruit and foliage at your local craft store. You'll also need a simple basket and some real or artificial nuts. Use hot glue to keep everything in place and allow you to store this centerpiece safely without damaging it. Place the basket on a protected work surface. Trim the leaves so that the stems are one inch or shorter. Use hot glue to affix the leaves all over the bottom of the backet. You'll need the tips of the leaves to poke up over the edge of the basket in a random way. Place some real or artificial nuts in the bottom of the basket. When you're happy with the arrangement of the nuts, carefully hot glue each one in place. Add the artificial fruit. Arrange it how you like and then use hot glue to secure it. You may want to add a few more nuts as well. Allow the glue to dry and then place the decoration on your table. This super simple design looks lovely on a rustic linen or burlap tablecloth or table runner. You'll need a simple open basket with a handle, small pumpkins and pumpkin-shaped gourds, dried wheat, and Indian corn. Place the basket on the table where you plan to display it. This centerpiece is not easy to move, so you should create it in place. Put a small bunch of dried wheat in the bottom of the basket, allowing the ends to stick out. Settle two or three small pumpkins in the basket. Add some pumpkin-shaped gourds, allowing one or two to spill out onto the table. Choose three pretty ears of Indian corn with the husk peeled back. Place these on top of the pumpkins. 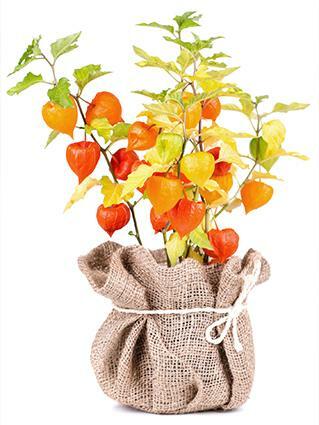 With their delicate, papery pods and bright orange color, Chinese lantern flowers are the perfect choice for a fall centerpiece. However, you can't always find them available for purchase. If you like, you can buy beautiful artificial lantern flowers from Factory Direct Crafts. You'll also need some florist's foam, a piece of burlap, some scissors, florist's wire, and some twine. Use a cube of florist's foam in the size you desire. Cut a circle of burlap that will more than cover the foam cube. Place the cube on the burlap and bring the sides of the burlap up to cover it. Secure with a piece of twine that goes around the outside of the foam cube and burlap. Cut several small pieces of florist's wire into lengths of about three inches. Fold each in half. Push these folded pieces through the burlap and into the foam, making sure the folded part of the wire goes over the twine. This will keep the twine and burlap in place. Cut several stems of the lantern flowers at different lengths. Insert the two or three tallest stems into the foam. If desired, you can use a bit of hot glue to keep them in place. Fill in with several more stems at shorter, varying heights. If you need a gorgeous, rustic centerpiece, nothing beats burlap fabric and canning jars. 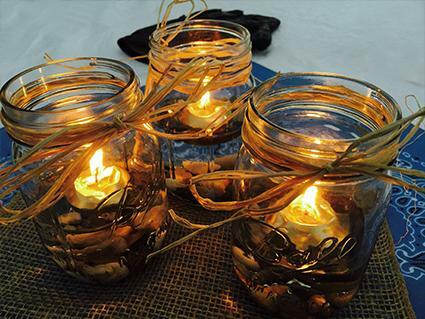 To make this simple design, you'll need three jars, some walnuts, raffia, burlap, and floating candles. You can buy simple floating candles at any craft store. Cut a rectangle of burlap fabric and pull out a few threads to fray the edges. Place three canning jars on the fabric. Wrap some raffia around the mouth of each jar, tying the ends in a bow. Put a few walnuts in the bottom of each jar. Edible walnuts will sink when placed in water, according to the University of Nebraska, Lincoln. Fill the jars about half-way with water. Settle a floating candle in each one. When you are ready to show off your centerpiece, light the candles. Sunflowers are a beautiful way to warm up your dining room on a chilly fall day, and they are the perfect choice for an autumn wedding too. This bouquet is simple and fun to make. Remember to keep the scale relatively small since sunflower stems can droop if they are too long to support the heavy flower heads. Choose a handmade vase, about eight to ten inches tall. You can use a vintage one or purchase a lovely example on Etsy. Select seven to nine sunflower blooms. Hold them in your hand and adjust so that they vary in height. The tallest should be in the center, and they should get shorter as you near the edge of the bouquet. Add foliage or filler if you desire. Use a pair of sharp scissors to cut the stems at an angle. Fill the vase with water and flower food and place the bouquet in the vase. These adorable paper pumpkins are fun to make, and when you group them together, they form a lovely centerpiece. You'll need orange paper ribbon, available at craft stores. If you aren't able to find scalloped ribbon, you can use decorative scissors to create the look you want. You'll also need a leaf-shaped paper punch, green and white scrapbook paper, some brads, double-sided tape, craft glue, a quilling tool, and green quilling paper. 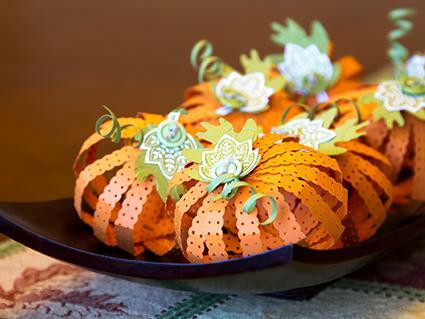 For each pumpkin, cut 16 strips of paper ribbon, each 12 inches long. If you desire, trim the edges with decorative ribbon. Form one strip of paper into a ring, securing the ends together with double-sided tape. Using this ring as a sizing guide, form the rest of the strips into rings, making each large enough to fit around the rings you've already made. Nest all the rings together. Use a brad to affix all the rings together in one spot. Use another brad on the opposite side to fix them together there as well. Fan the rings out to create a three-dimensional pumpkin. Use a quilling tool to create green spirals out of the quilling paper. If you're not familiar with the process, these quilling instructions can help. Use the leaf-shaped punch to make green and white leaves. Attach these and the quilled spirals to the top of each pumpkin with craft glue. Make several pumpkins and display them on a platter as a crafty centerpiece. 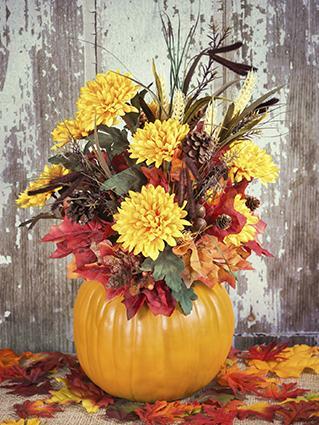 This stunning floral arrangement is perfect for any fall gathering. It's a bit more complicated to make than some of the other centerpiece options, but the results are worth the effort. You'll need a medium-sized pumpkin, a plastic container that will fit inside it, floral tape, artificial leaves, wheat, large blossoms in fall colors, and filler. Your pumpkin arrangement will last for a few days if you keep it in a cool place. Begin by cutting the top off the pumpkin using a knife. Discard the top. Hollow out the inside of the pumpkin with a spoon. Nestle a plastic container inside the pumpkin. Choose a container that's as tall as possible without showing over the edge of the pumpkin. This will hold the water for your floral arrangement. Fill the container 3/4 full with water and floral food. Choose nine to 11 large fall-colored blooms, such as dahlias, sunflowers, or gerbera daisies. Take three of these blooms in your hand, arranging them at slightly different heights. Add in a few pieces of filler and dried wheat. Then add more large blooms. Continue adding filler and blooms until your bouquet is the desired size for your pumpkin. As you get close to finishing the bouquet, add lots of brightly colored artificial fall leaves. Wrap the stems in floral tape to secure them. Trim the ends to the desired length. Place the bouquet in your pumpkin vase. Add more artificial leaves around the edge to help support the bouquet and disguise the plastic container. Display the centerpiece with pride. 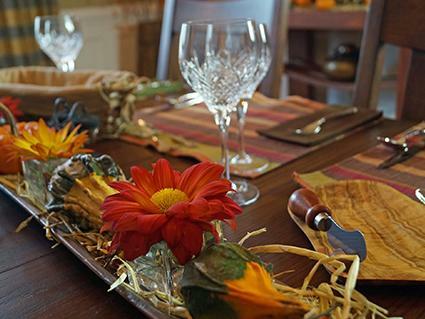 If you love making Thanksgiving and fall crafts, try your hand at a special centerpiece. Your design will add seasonal flair to your dining room or help bring autumn cheer to any special event.